I’m beginning to wonder who designated 2009 as the year of the side-scrolling martial arts beat-‘em-up. With the release of Invincible Tiger: The Legend of Han Tao earlier this fall, it’s certainly interesting to see this game pop up so soon afterwards. Revenge of the Wounded Dragons is the story of two brothers whose father/sensei/requisite plot device has been murdered and their sister kidnapped by… well, someone. In a game like this, the plot doesn’t really do anything but give you a reason to gut-punch a bunch of cronies and it does its job. You’ll kick and punch your way through the game, and like the aforementioned Invincible Tiger, you have a number of finishing moves you can pull off on stunned enemies to get bonuses to your point multiplier. Enemies in each level can drop whatever weapon they were carrying, giving you a limited-use tool to knock the teeth out of whoever is foolish enough to stand in your way. A number of collectible statues litter each level, but none are particularly well-hidden. Outside of the funky 70’s kung-fu flick soundtrack (one track of which is such a liberal lifting of the O-Ren Ishii anime segment of Kill Bill Vol. 1 I nearly dropped the controller in shock), the game lacks a lot of personality that helps make simplistic titles like this stand out. The levels are largely a left-to-right affair, and though there are some jumps to be made and ladders to climb, it feels almost like playing NES Kung-Fu, with a touch of Double Dragon, but none of the charm that made those games classics. The biggest problem for me is actually one that plagued a lot of early games in this genre- mainly that the player characters don’t look different enough than the already generic enemies. Though it’s certainly easy enough to kick and punch your way out of crowds, there are times when you might actually lose track of yourself. Despite much of the game being middle of the road, the (local-only) co-op manages to be pretty fun. Wanako wisely mixed up the gameplay to account for a second player, adding co-op takedowns, the ability to funnel life from one player to another and even going so far as to change the way your kicks work. Bringing a buddy along is definitely the way to play the game, since the extra abilities add more depth to the combat. In co-op you’ll be able to hold onto an enemy and have your buddy beat on them, you can kick an enemy back and forth to each other, and even vault over your partner for a flying kick that would make Liu Kang proud. The various switches you come across in the single player game (that don’t serve much purpose there) are now simple puzzles that require the players to trigger for their partner to progress, holding doors open, opening trap doors and other trivial matters. They’re not really an obstacle to progress, but they do make for a nice change of pace. 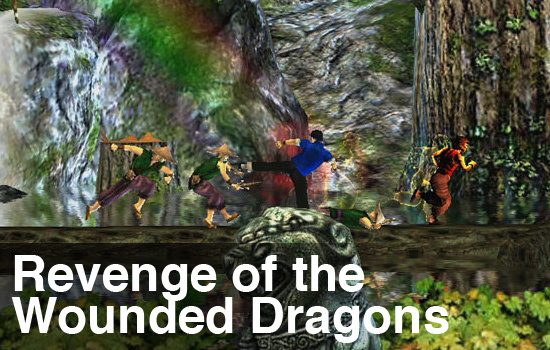 Whether or not you will enjoy Revenge of the Wounded Dragons will largely rest on the shoulders of the co-op. As a single player experience, it leaves a lot to be desired, but the added depth of the co-op combat is just enough to make it fun to play. Page created in 0.9923 seconds.